Rio is just awesome when it comes to natural beauty. The view of rio is quite charming and having a sneak view of almost whole of teh city from one place - awesome.. sugarloaf is one of those places which provides a 360 degree view of the city. Basically Sugarloaf is a set of two hills, connected to each other and to the ground by roap way. First one needs to take a ropeway trip to the lower hill top and from there to the higher one. 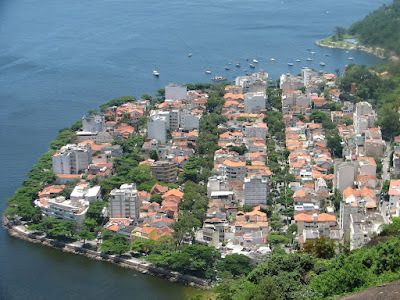 These hills are next to the sea and their heights give unabated view of different sides of the citiy. The lower hill presents a picturesque view of teh city, giving a glimse of various parts of the city, its road, ports, bridges etc. 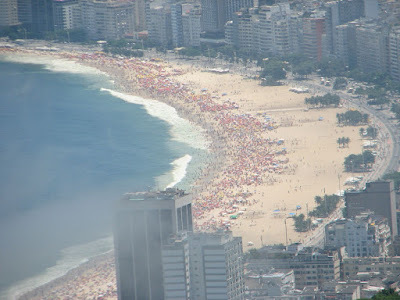 Whereas the lower peak gives youa view of the city, the higher one lets you capture the beauty of half-moon shaped copacabana beach with your camera lens. Thogh there is no activity to be performed over the top, the view it unfolds makes it a must for the vistors to reach there and the panaromic view makes sure that one does not wants to leave the place so easily. Sugarloaf also provides a view of Corcovado . 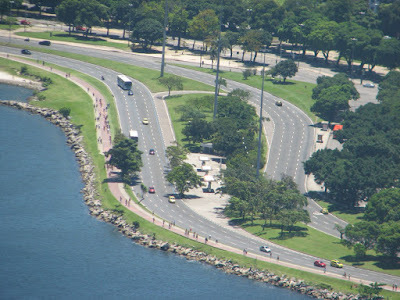 Hi Prashant, just now i got to know your blog, am really happy and proud of your Rio posts! Nice writing!